I typically prefer cocktails with at least touch of effervescence, so it’s probably not a surprise that I’m quite fond of Champagne — or more accurately, sparkling wine — cocktails. My sister, Chloe, and I had a great time coming up with this cocktail when I was back east visiting her and her boyfriend a couple weeks ago. It all began because we couldn’t resist picking up a bottle of black mulberry juice at Stew Leonard’s. The first try was far too gin-y, the second too blah, flat, and then Chloe came up with the brilliant idea to enhance the cocktail with a simple syrup using the juice instead of water to avoid watering it down. 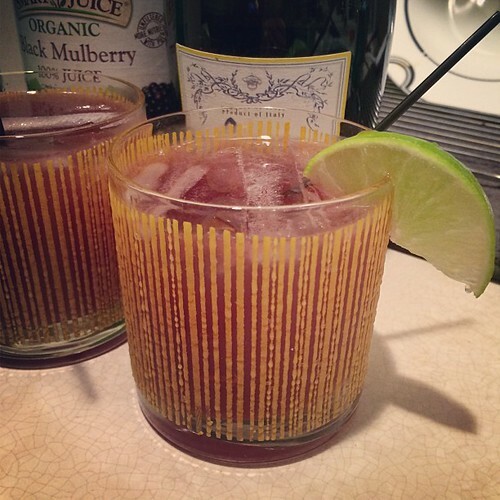 The resulting mulberry-lime concoction was the perfect balance of tart, sweet and bubbly elements; a splendid, but no less festive departure from the classic French 75. In a cocktail shaker or Mason jar, combine simple syrup through gin with a few cubes of ice. Cover and shake until well-chilled. Strain into two glasses and divide Prosecco between them; gently stir to combine. If desired, add a few cubes of ice and a lime quarter to each glass. Serve immediately. In a small saucepan, combine juice and sugar. Bring to a boil over high heat, stirring occasionally. Boil for 1 minute, then remove from heat and allow to cool to room temperature before using. Store leftover syrup in the refrigerator for up to 1 week.